This entry was posted in Fun Stuff on December 2, 2016 by Steve Tilford. 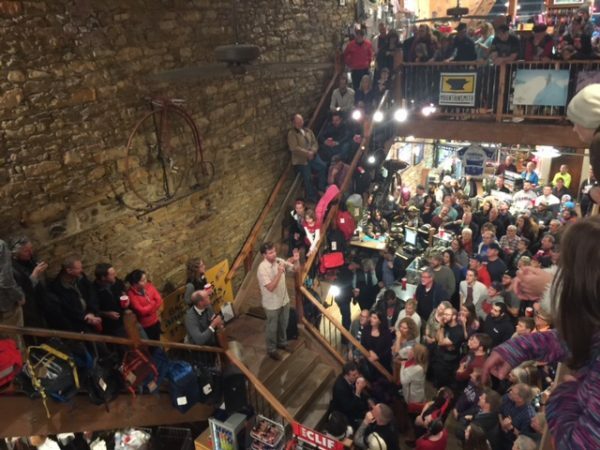 Last night Sunflower Outdoor and Bike had its annual customer appreciation party. It is usually the first holiday deal of the year around here. At least for me. I was a little apprehensive about going there, thinking that I only have a short amount of time I can keep an energy level up good enough to enjoy a holiday party. But, I did alright. 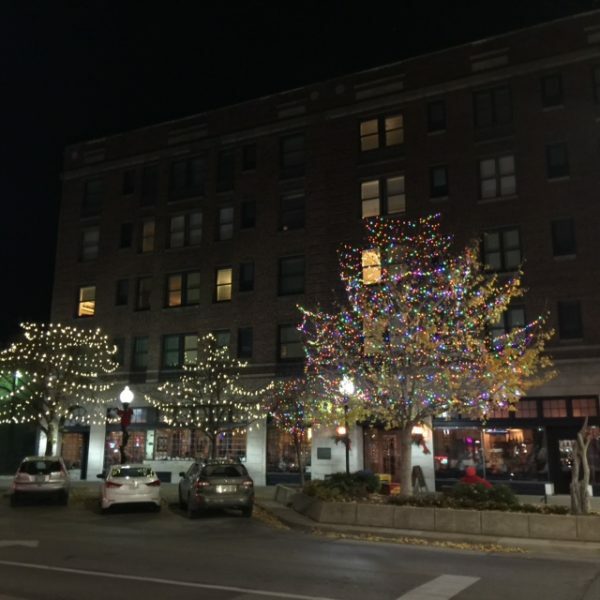 Downtown Lawrence Kansas around the holidays is great. It is really decorated and pretty. The downtown area is sort of the original downtown from the 1800’s. Many of the building, including Sunflower, have limestone foundations and walls. I like that. Dan Hughes is the proprietor of Sunflower, so the MC. 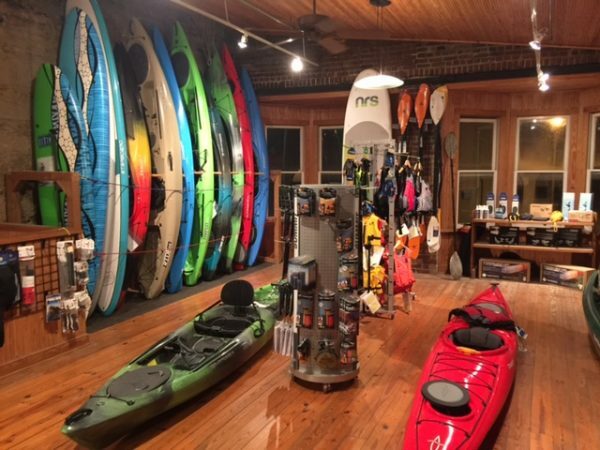 It is a great shop. If you ever have a chance to go by, you should. Dan has won the DK 200 more than a handful of times. Anyway, Dan is great and keeps a festive atmosphere. He gives away a ton of stuff and does a raffle that gives away a lot of other stuff too. A guy I ride with from Lawrence, Marcos, young daughter won a Rockshoc Sid 29’er fork. She said that she was giving it to her dad for Christmas, which is sweet. Everyone there was so nice to me. Wanting to know how I was doing and saying that I looked so much better than they thought I would. I guess that is good, I think. Anyway, I held up okay. I took a stroll down Mass. St. during the middle to get some fresh air, which really helped. I slept nearly 8 hours last night, which is a record by miles. I don’t feel that great, but it has to be a good thing. I have two doctor’s appointments today. This will be the last ones for a couple weeks. I’m sort of tired of the whole routine, even though I understand that it is important. The deal is I’ve learned just about everything I’m going to know about what is the matter with me. And that seeing a doctor isn’t really going to help much in the near term. At least if it stays status quo, which is good. 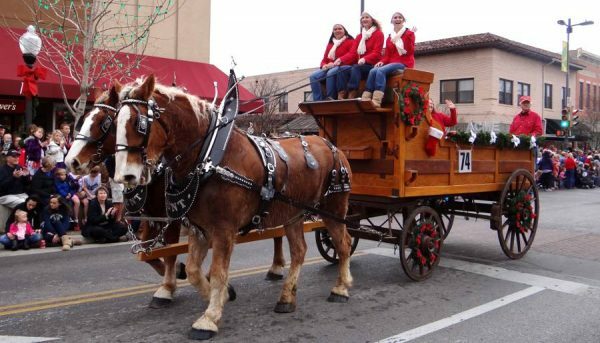 Okay, tomorrow is the Old-Fashioned Christmas Parade in downtown Lawrence. Over a 100 horse-drawn carriages. I usually ride there, but not this year. But it will be great getting out of the house for sure. Hope you have a good weekend. Dan talking to the masses. The parade a couple years ago. Massachusetts Street is all like this. Very festive. Sounds like you’re out of the tunnel. When our daughter toured KU I stumbled into Sunflower and loved it. We walked by Sunflower after eating at Free State and saw the commotion inside. I thought of you but assumed attending would be too much for you. Sorry I didn’t get to see you. We were in Lawrence for the NCAA Volleyball Tournament 1st & 2nd rounds.